A party sensation! 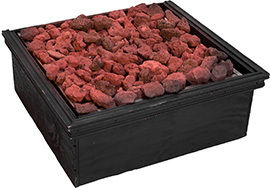 You and your guests can dip strawberries, other fruits, cookies, marshmallows and whatever else your heart desires in a flowing "chocolate fall". Its a great dessert centerpiece for a dessert buffet or a "top notch" wedding. 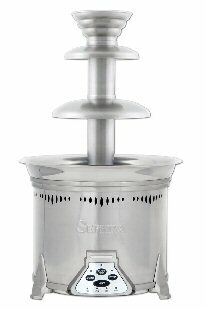 Original Brushed Stainless Fountain . Designer Polished Stainless Fountain . Standing at 27 inches tall this fountain will serve 150 to 325 people with ease. Use white, semi-sweet, milk, or dark chocolate. This product is taking party extravaganzas to the next step. 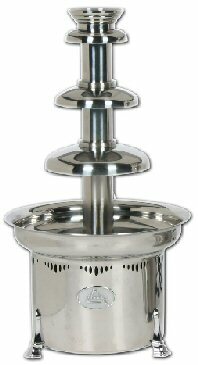 Miniature Commercial Stainless Fountain . Standing at 19 inches tall this fountain will serve 35 to 95 people. Use white, semi-sweet, milk, or dark chocolate. Be the life of the party when you bring this hit through the door. This 18" x 20" S'mores burner will allow you and your guests to enjoy a summer favorite all year round without the need to be outside! Just like the smaller version but a bit larger coming in at 8" x 42" which makes it a great addition for any banquet table.